Bohuslän, which begins in Gothenburg’s Archipelago is one of Sweden’s finest resorts, and is often listed in the world’s press amongst the most desirable travel destinations on the planet. We consider ourselves very lucky to work in such a fantastic environment, introducing people from all around the globe to our wonderful west coast paradise. Gothenburg’s archipelago is made up of a large number of inhabited islands. The southern archipelago which belongs to Gothenburg county and the northern archipelago which belongs to Öckerö county. The border of these two is also the border of Västergötland and Bohuslän. Both archipelagos have their special charm, but also have very different characteristics. For shorter trips we favour the south archipelago. This gives us a chance to explore a selection of cosy narrower passages and offers good shelter from changeable weather. We stop at Brännöbrygga for a traditional dance or at the pubs and bars on Donsö, Styrsö, Brännö or Knarrholmen. The islands here also have no cars, because the ferries don’t take cars. The northern archipelago is made up of the 3 largest islands: Öckerö, Hönö and Björkö as well as a handful of smaller islands. If you’re more of a food enthusiast, we would definitely recommend coming here to enjoy the great west coast cuisine. There are a number of very good restaurants on Hönö, Björkö and Källö Knippla. Our favourite route here is the straits between Björkö and Kalvsund. Normally we tour the southern parts of this coast, with Marstrand, Klädesholmen och Åstol being the 3 classic destinations for us and our guests. These islands offer the finest opportunities for exquisite food, parties and conference events. We are also well within reach of several other very popular harbours including Mollösund, Kärringön and Tjörn. Bohuslän stretches all the way up to the Norwegian border just north of the Koster islands. If you’d like to include this stretch in your tour, it takes from 3-4 hours depending on conditions and speed, so we’ll be happy to fit that in too if you’d like. Below is some information about our favourite places to tour. The best thing about 57 Grader Nord is that we more or less let you choose where we go. And we always love discovering new pieces of paradise! It’s no surprise that Vinga is one of our favourites. This horseshoe shaped island is around ten nautical miles from Gothenburg and is well known for its lighthouse. It was home to the famous Swedish folk singer Evert Taube, who spent his childhood years here. The island is the furthest west in the archipelago but reachable in under 20 minutes from Långedrag at a cruising speed. The harbour is well sheltered even on days when the sea is rough. As you glide through the straits between Vinga and Koholmen you can sometimes see the sea bed, up to 10 meters below. In the summer the shops are open and you can take tours of the lighthouse and other historical buildings. Vinga is also a great place to relax with a glass of wine or a beer, so we bring some with us for you to enjoy on board or on the rocks. Picnic facilities are available and there are small huts in case the sun goes in. We are always keen to take a detour round some of the other islands and pass under the bridge between Styrsö and Donsö on the way to Vrångö, which is the furthest south of these inhabited islands. The guest harbour is on the west side of the island. If we stop for an hour or so, you’ll have enough time to climb up to the pilot house. It’s worth it for the spectacular view over the southern archipelago. There’s a Sauna raft in the harbour which is available for hire, conference facilities along the quayside, and several nice footpaths that take you inland, if you’d like to explore the island that way. This island is protected by the military so we don’t get to explore here, but we do like to glide past slow enough so you can admire the old navy barracks and quarantine station. Marstrand never fails to impress us. There’s something here for everyone, and only a 30 minute ride from our home harbour at Långedrag. 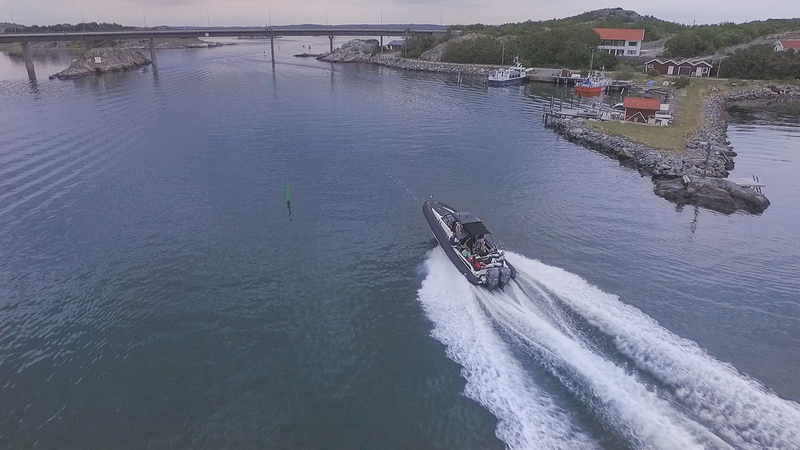 The first part of this journey is a good opportunity to test the top speed of our boat, then we can ease the throttle down and glide at a relaxing pace of 5 knots as we enter the Albrektsunds canal. 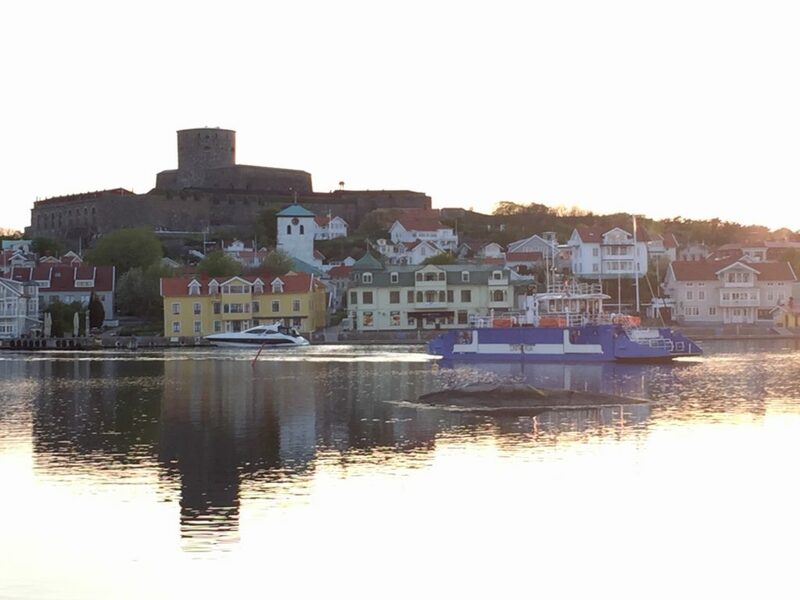 It’s just as breath-taking every time as we round the last corner and catch the first glimpse of Marstrand’s mighty fortress, Carlsen’s Fästning, which proudly stands at the highest point on the island. We dock either at Havshotellet on Koön or at Marstrand itself. Havshotellet has everything you need: Spa with sauna raft, restaurant with terrace on the pier and conference facilities. It’s perfect for an overnight stay. Marstrand island itself offers an even wider range of pubs and restaurants. If it’s your first visit, we heartily recommend a stroll through this picturesque community, and why not continue up the hill to take a tour of the fortress?